The Bridgewater Planning Board will be conducting a public hearing on an application filed by the South Shore Community Church to construct a new church facility consisting of a 980 seat sanctuary with associated administrative, educational and child care facilities, 454 parking spaces and associated improvements on a 59 acre parcel of land located on Elm Street. This meeting is open to the public and all interested parties are encouraged to attend. It looks like downtown will be losing a business on Broad Street. Prescott's Flowers & Gifts located at 4 Broad Street in Bridgewater is going out of business. Signs in the windows indicate that the entire store is 50% off. Go check it out today and hopefully you will find some good bargains! On behalf of the Around the Common family, Merry Christmas! The Christmas Eve service at Trinity Episcopal Church will take place on December 24th at 7:00 PM. Trinity Episcopal Church is located at 91 Main Street in Bridgewater. Please join the Rotary Club of the Bridgewaters at this month's breakfast meeting. To make a reservation, please call Bruce Marquis at 508.378.7890. In case you did not see it, the Brockton Enterprise did a very nice piece on Around the Common selling the popular BWTR stickers to raise money for Operation Santa. Click here to read the article. To date, we have raised $100.00 for the Operation Santa drive. Donations are still being accepted and should you not want a BWTR sticker but still would like to donate, donations still can be made by either contacting Around the Common or by dropping toys off at the Bridgewater Fire Department. Thanks to all of you who have supported the drive so far. Let's keep the money coming in! Are you interested in learning more about some of the history behind your family's surname here in Bridgewater? Check out this website to research genealogical information broken down by family name. Click here to give it a try. Around the Common welcomes 1st Choice Home Improvement Associates to our Bridgewater business listings. When considering a company to give your business to, Around the Common urges you to seek out a Bridgewater business first! When it comes to replacement windows and home remodeling for your Massachusetts home, some say to expect the best but prepare for the worst. At 1st Choice Home Improvement Associates, they believe you can ensure your remodeling process will run as smoothly as possible. Every year, they successfully perform numerous remodeling projects for homeowners in the South Shore area. Their owners are experienced and know how to get it done right. Your first step is to schedule a free consultation. When you engage 1st Choice Home Improvement Associates, you can rest assured that you are working with an established, local remodeling company that is licensed and insured, and that has earned the remodeling industry’s respect and community recognition. From groundwork to the finish work, 1st Choice Home Improvement Associates will customize your home remodeling project to fit your needs. The owner works closely with you to ensure that from conception to completion a homeowners dreams become reality. If you are looking for a South Shore remodeling contractor, then please call one of the owners of 1st Choice Home Improvement Associates. Richard Russell can be reached at 508.801.3482 or Paul Nee can be reached at 508.801.3725. For a free consultation, complete their online request form by clicking here. "Celebrate Christmas" is a contemporary Christmas instrumental and choral concert that will be held on Dec. 14th at the Trinity Covenant Church at 1095 South Street here in Bridgewater. This event is free to the public. Refreshments will be served beginning at 5 p.m. and the program will start at 6 p.m. For more information call 508-697-2226 or email mailbox@trinitycovenant.net. Show up between 12-1pm and get your picture taken with Santa! Refreshments by Rockin K Cafe. Half off selected items and artwork. If you haven't been to their location in a while, stop in to see all of the new wonderful handmade items. Part of all proceeds will benefit our tuition assistance program. Vocal musicians Donna Ames (mezzo soprano) and Mark Anderson (Bass) will present their holiday performance at the Old Bridgewater Historical Society in West Bridgewater on Friday December 19 at 2:30PM. The venue is small but lovely and this annual performance is considered the “jewel” of the Bridgewaters’ holiday season. Homemade light refreshments are served after the concert. Because of the small venue, admission is by reservation only. To make a reservation, call Maureen Lynn at 508-223-7207. Tickets are $12 each; buy 3 and the 4th is free. A check made payable to the Old Bridgewater Historical Society may be taken to the performance to pay for the reserved tickets. Boy Scout Troop 88 is having is having their annual Christmas tree pick up fundraiser. Let them come and pick up your Christmas tree after the holidays. Suggested donation is $7.00 per tree. Please call 508-697-6841 to schedule your pick up. The popular BWTR stickers you have seen around town recently are still for sale! This month, all proceeds from the sale of the BWTR stickers will go to the Operation Santa Toy Drive. This is a great holiday gift and the ideal stocking stuffer and is an excellent way to support a good cause. The BWTR stickers cost $5.00 each. If you are interested in purchasing a sticker, please contact Kevin by clicking here. A Winter Music Concert will take place this Wednesday night at 7PM at Bridgewater-Raynham High School in the new auditorium. The concert band, chorus and jazz band will all perform. This event is sponsored by the BR Music Boosters. The Friends of the Bridgewater Public Library are selling Burnell School commemorative ornaments for $5/each. These ornaments make a great stocking stuffer for any Burnell alum on your list!! These are NOT for sale at the library, but you can order one (or more) by emailing the library at bwpl@sailsinc.org or by calling Mary O'Connell at 508-697-3331. The Garden Club will hold a workshop for children in grades K-2 on Tuesday at 4:15 p.m. at the senior center. The children will learn about hollies, greens and other decorations to make their own arrangements to take home. Reservations are required by calling 508-697-4644. This will also be held on Wednesday for kids in grades 3 and higher. 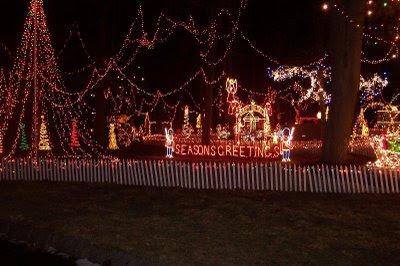 The Bridgewater Festival of Lights will begin on December 5th and will run through December 25th. The Festival of Lights is open from 5 PM to 9 PM each weeknight and stays open late until 10 PM on weekends. While admission is free for this great event, donations will be accepted to give to charity. For more information about the Bridgewater Festival of Lights, click here. Some of the charities that have benefited from the Bridgewater Festival of Lights include Bridgewater Lions Club, Bridgewater Support Our Troops and Toys for Tots. The Cranberry County Chamber of Commerce will be sponsoring their Holiday Business After Hours which will be hosted by Bridgewater Credit Union at 75 Main Street on Tuesday, December 9th from 5-7 PM. The event will include refreshments, music and networking opportunities. The event is free to Chamber of Commerce members but reservations must be made. To do so, please call the Chamber of Commerce at 508-947-1499 by Friday. The Friends of Williams and George Mitchell School Parents Association (GMSPA) are sponsoring Santa’s Workshop & Craft Festival. All proceeds from this event will directly benefit the students at the George Mitchell Elementary, Williams Intermediate, and Bridgewater Middle Schools. This exciting annual event includes a “Just for Kids” Shop, photos with Santa, a bake sale, holiday crafts, lots of cool raffles, and a vendor / craft fair. The “Just for Kids” Shop offers hundreds of items priced at only $1.25 so children can purchase items for their family and friends. There will be more than twenty-five vendors at the fair, including Body Shop @ Home, Cakes by Paula, Earth’s Elements, Gowells Candies, PartyLite, Tastefully Simple, Tupperware, and lots more. Please join us for this fun-filled family event and help us make this day a success!! !